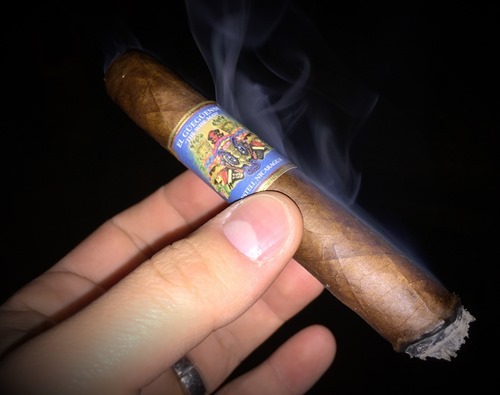 Made at the TABSA (Tobaccos Valle de Jalapa) factory in Nicaragua using Aganorsa tobacco, El Güegüense—also known as “The Wise Man”—is the first blend from Foundation Cigar Co., which was launched in 2015 by former Drew Estate employee Nicholas Melillo. The Nicaraguan puro has a beautiful Corojo ’99 wrapper from Jalapa that’s described as “rosado rosado café.” My favorite El Güegüense vitola is the Corona Gorda (5.6 x 46). It boasts a medium-bodied profile with well-balanced flavors of cedar, honey, melon, and subtle sweetness. With excellent combustion properties, ample complexity, and a sub-$10 price tag, I’d revisit this cigar if you haven’t had it in awhile.